Push and Pull, a new way to build your corporate innovation strategy. I gave a talk this week to Corporate leaders during the NRF in NYC. Addressing a hot subject for the corporate world: How to go beyond innovation departments and build efficient startups? 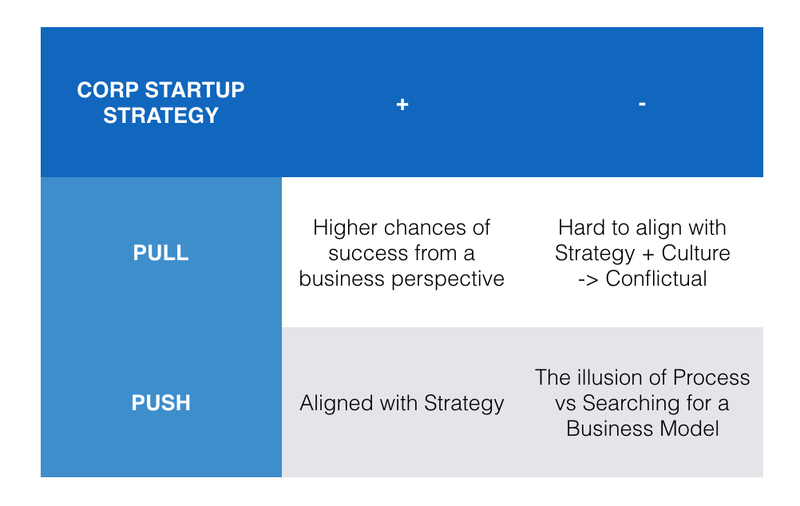 I introduced a new framework to help corporations think their startup strategy: Pushing vs Pulling Startups. There are 2 tactics for corporations looking to launch new startups. The first one is called Pull, it relies on identifying relevant existing startups in the startup ecosystem, to “Pull” startup, knowledge, founders and even capital toward the corporation. 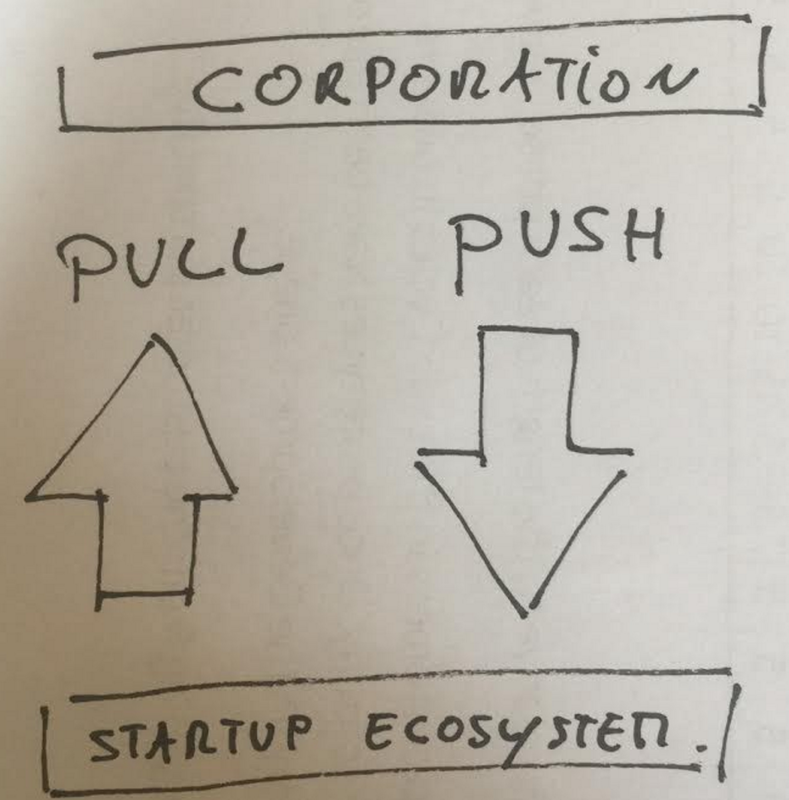 The second one called Push fits well the corporate taste for control, in that case the corporation “Pushes” ideas, capital and products outside in the form of a startup. To push, a corporation or at least some of its leaders needs to act as an Entrepreneurial Proxy. The current toolbox is expanding for corporations looking to launch new projects in the form of a startup. Here is a non-exhaustive list of them classified as Pusher or Pullers. Success rates are always hard to express. If I were to use the $1b mark, then accelerator would drop at 1/10,000 while VC might go down to 1/1000. This is a rough estimation based on the current market some articles and my own experience. M&A are the ultimate pull, it plays the role of integrating what is outside, inside the corporation. 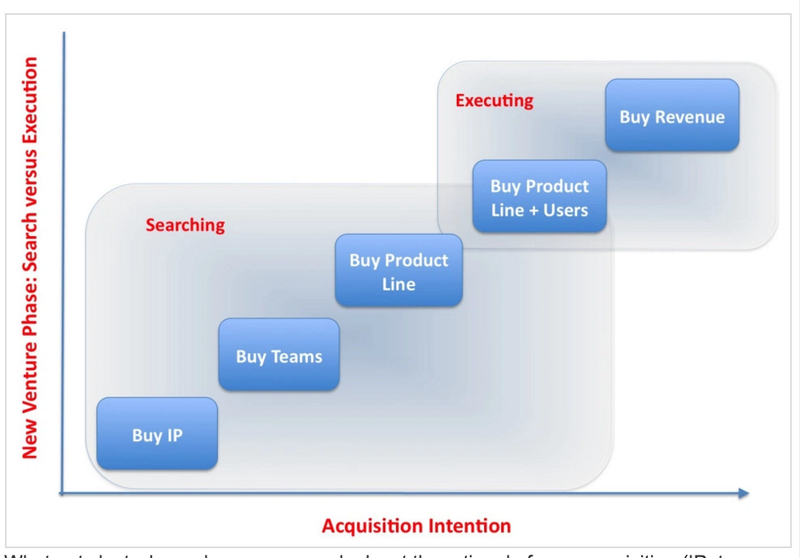 As described by Steve Blank in his post , Steve observed that acquisitions were usually not adapted for the specific stages of a startup (searching for a business model) Corporation looking to pull projects needs to understand this to avoid breaking the growth of the acquired startups. In opposition to an M&A a spin-off is the ultimate push. Ultimately you can think of this framework as something very similar to open innovation, where the notion of pulling and pushing applies to IPs outside and inside a corporation. Should you Pull or Push? Pushing to innovate is highly risky, you might be able to leverage unfair advantages, but you are falling at risk of not getting the best out of the eco-system. Therefore Pushing make sense for specific innovations. keep in mind you are competing with other early stage startups on the edge. A way to Push while minimizing financial risks is to push for defense, meaning copy catting an early stage company. This work while the market is not yet mature, you will also need the right people to lead this “attack”. Pushing when the market is already mature rarely work, Barnes and Noble vs Amazon is a good example. If you think the market is flipping then pulling makes more sense. When you want to attack a market, pulling is the best option. As explained before it is more expensive than Push but it gives the corporation a higher level of success. Acquiring fast, like Facebook did with oculus was a better attack strategy than launching their own VR startup or department. Both strategies have Strength and weaknesses, Pull gives the advantage of the natural selection, while Push limits the political friction. But Pull faces the too famous issue of letting the big corp, crushing a beautiful startup while Push might just be purely delusional and end up being an “innovation theatre”. Leveraging corporate unfair advantages using pushing forces too soon might just transform your beautiful and agile startup into a bureaucratic and slow Business Unit. Likewise pulling innovation from the ecosystem might just crash it against the corporate walls of internal politics, with no hope for further growth. 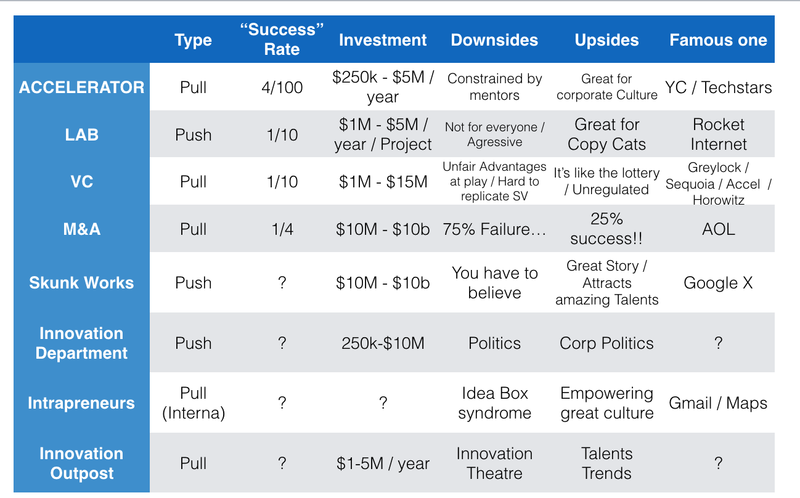 Corporate executives needs to balance these forces as the startup grows… let’s call this the Pull/Push startup engine.